Many people find that over time that their teeth become damaged, whether due to injury, wear, decay, or genetics. While the individual teeth can be saved, the overall shape, color, and strength can be affected. When that happens, our dentists at Bridge Creek Dental can offer you dental crowns to help correct those issues with your teeth. Porcelain/ceramic – A dental crown made of porcelain is the most natural looking material used for a crown. It can be easily color-matched to the rest of your teeth and is highly durable. Stainless steel – While not natural looking, stainless steel is often used on children’s teeth, as they may only need it for the short-term until permanent teeth grow in. Some adults opt for stainless steel crowns on out-of-sight teeth. Stainless steel is a very durable material. Gold alloy – A gold alloy crown (not pure gold) is blended with porcelain to create a strong, sanitary metal crown. These crowns are often used on out-of-sight teeth. Resin – Dental crowns made of resin are less expensive than other dental crown materials. However, they tend to be less durable than other types of dental crowns. Once the crown has been made, the tooth is prepared. 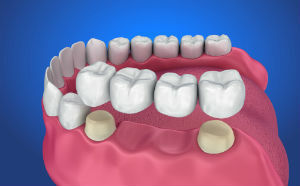 The crown is placed on to the prepared tooth and secured with dental cement. Tooth that are damaged and fragile but have a healthy root structure in place can be preserved with a dental crown. However, they are beyond what a simple filling can repair. 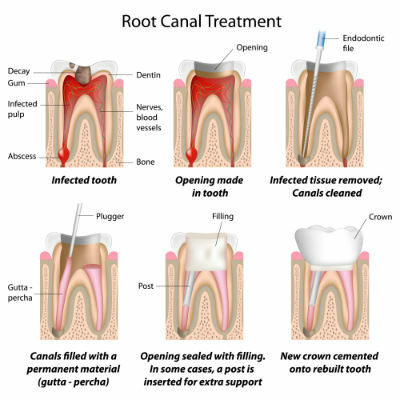 Often, dental crowns are used post-root canal procedure to protect the newly repaired tooth and nerve. They’re also used when a tooth is susceptible to cracking and crumbling due to decay or injury. Dental crowns do more than protect your teeth. Many of our patients have come in for dental crowns to help perfect their smiles, giving them a more natural and even appearance. 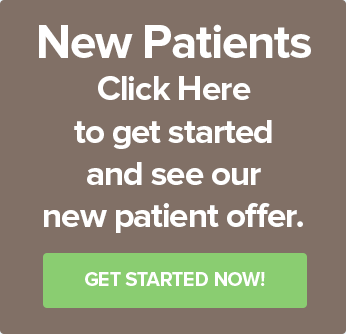 In some cases, our dentists have even replaced dental crowns placed by other dentists to give patients the natural-looking smile they desired. Our Smile Gallery has an area dedicated to a Crowns Gallery, so you can see the kind of dental crowns our dentists use to give our patients their ideal smile. Once a root canal is done, there is not much of the tooth that remains above the gumline. 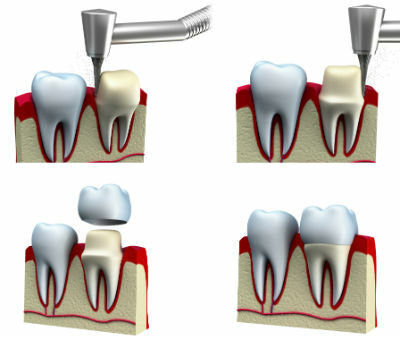 To protect the new filling and the root of the tooth, a dental crown usually completes any root canal performed. When you have teeth missing, you can have our dentist create a dental bridge for you. Dental crowns are used to create many traditional dental bridges, where one to two teeth will have dental crowns applied to the teeth surrounded the area where the missing teeth are located. Teeth which are too damaged to be salvaged or completely missing may need to be replaced with a dental implant. 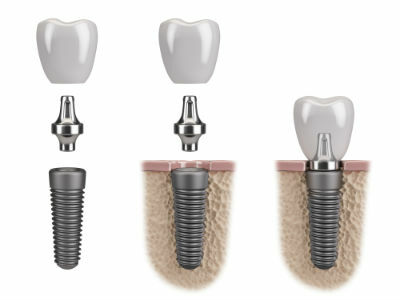 A dental crown is applied to the top of the dental implant post to give your teeth an even and natural look. There are many other things to examine when you are considering having one or more dental crowns placed by our dentists. Cost – Dental crowns on their own can cost anywhere from $500-$3,000 per tooth, depending on the dentist and the difficulty of the placement. Procedures surrounding the placement of the crown, such as a root canal, can drive up the price, as can the chosen materials. Longevity – On average, dental crowns last around 10 years. Excellent care can ensure your dental crown lasts beyond 10 years. Durability – Some care will be needed when you have a dental crown. Extremely hot or cold foods can damage a dental crown, causing it to crack. You may need to be careful of the temperature of the food you consume. At the initial appointment, a scan or a mold is taken of the natural tooth. The data is sent to a lab that constructs the crown out of the selected material, then the lab sends it back to the dentist. At the second appointment, the dentist shapes the natural tooth to receive the crown, generally by grinding it down or grinding away damaged or decayed portions. The crown is affixed to the natural tooth using dental cement. The dentist makes minor adjustments to the shape of the crown and ensures that it fits naturally in the patient’s mouth and doesn’t affect the bite. If you are interested in receiving a dental crown from our dentists or other dental services, contact us today for an appointment and start the process to move you further towards your dream smile.